Are you suffering from flood and water damage in the Pomona area of California? Whether it be from a broken water pipe in your home, to a massive multi-story water damage problem at your business, the expert cleaning and remediation technicians at Superior Cleaning and Restoration Inc. are here to serve you. We provide superior service, accept many major insurance companies, and leave our customers property in a superior state. We leave nothing to chance because we cover you throughout the entire process of water damage remediation. We will also work with you if you do not have insurance. Rest easy knowing that Superior Cleaning and Restoration Inc. is handling your water damage cleanup. How quickly can you respond to my flood and water damage emergency? We understand that flood and water damage doesn’t always happen at appropriate times. That is why Superior Cleaning and Restoration Inc. operates 24/7. You can call our operators anytime of the day or night and we will be here to get your damage sorted out. Our professional cleaning and restoration experts work quickly and efficiently to remediate your residential, or commercial, property. Aren’t modern homes protected against water and flood damage? This has been brought up by a lot of builders and contractors, but the fact remains that there is no 100% way to protect every property from flood and water damage. Even with modern building materials, water has to be ran through the walls to get to where you need it. Life happens, and we are here to help. If you are suffering from water damage that is driving you up the wall, give us a call. The peace and tranquility that Pomona brings is one of the reasons the residents live here. Don’t let the damages of water and flooding ruin your peace of mind. 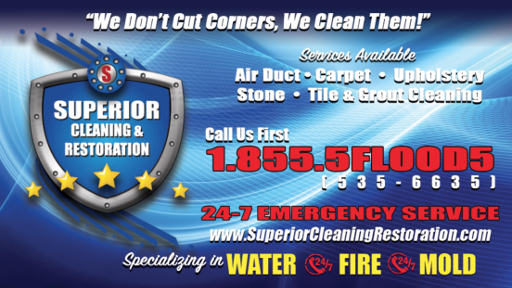 Call Superior Cleaning and Restoration Inc. for a free quote to get started. We can help get started on your water damage cleanup immediately. Our operators are standing by 24/7 to handle all of your water and flood damage emergencies.